HSS is the abbreviation of Square Hollow Sections. Square Hollow Sections (SHS) also called sqaure tube or square pipes which the steel pipes have the equare side legth. Is made ​​of the strip after the treatment process volume. Generally strip After unpacking, smooth, curl by the tube rolling into square tube welded to form a tube, and then cut to required lengths. Generally 50 per package. 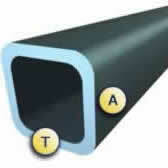 The square tube is a hollow square section lightweight thin-walled steel pipes, also known as steel cold-formed profiles.